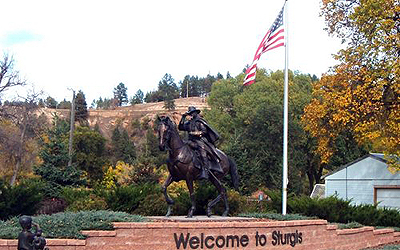 The city of Sturgis was founded in August of 1876. It was named after Major Samuel D. Sturgis, a commander at the nearby Fort Meade Cavalry Post, located on the eastern edge of Sturgis. During the great western expansion, Fort Meade served as a United States Cavalry post to nearly every cavalry regiment in the U.S. Army. Soldiers trained at Fort Meade served in the Spanish-American War, the Pancho Villa Incursion and World Wars I and II. The Star Spangled Banner became part of the evening military retreat ceremony at Fort Meade in 1892, long before it became our national anthem. Although fur traders, explorers and military expeditions were among the first non-natives to visit the area that now makes up Meade County, it wasn't until the discovery of gold in the Black Hills that a large number of white settlers came to the area. In the Gold Rush days, the 3 famous historic highways to the Hills converged at a stage station near Bear Butte. 4 public schools offer education to local students of all levels from pre-school up through the end of high school. Higher education is provided by Black Hills State University in Spearfish just 25 miles away. Chadron State College is an alternative within a 2 hour drive. Sturgis Community Health Care Center serves the area's health care needs. The Sturgis Motorcycle Rally is an annual event that was founded on August 14, 1938, by the Jackpine Gypsies Motorcycle Club, who still own and operate the tracks, hillclimb and field areas that the rally is concentrated around. The rally typically brings more than 500,000 motorcycle enthusiasts to the area each year. 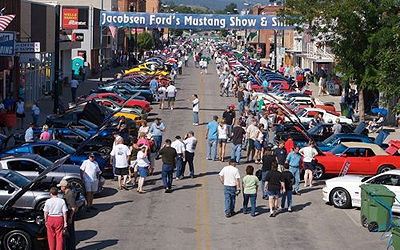 Rally attractions include motorcycle tours, races, lots of vendors and a wide variety of great food. Lovers of the outdoors will find plenty to embrace around Sturgis. Bear Butte State Park is close by and offers the opportunity to explore the scenic Mato Paha, or "Bear Mountain." The mountain is sacred to many American Indian tribes who come here to hold religious ceremonies throughout the year. You can fish in Bear Butte Lake, hike around the water or up Summit Trail, camp, horseback ride or visit Bear Butte Education Center to learn about the history of the mountain.